Participants enjoyed overcast conditions and cooler-than-expected temperatures at Moonbi Hill TSR on Sunday 13th October. A huge thankyou to Bruce Haigh for his assistance with setting up and running this event. Don Barker fully exercised the bragging rights after coming in first on the Hard Long course, followed closely by Felix Burkhard and Alinto Merrotsy. On the Moderate Long course, Michael Smart comfortably beat the hour, followed by Andreas Tillman then Imogen Dean. Maurice Anker, Shani Rajasekera and a group consisting of Victoria Spanswick, Henry Shelley, Oscar Shelley, Ellie Andrews and Will Andrews were the top placegetters on the Hard Short, Moderate Short and Easy courses respectively. Apologies to Zoe Barker-Smith that fence crossings provided too much of a barrier. Sunny and warm conditions attracted a record 33 individuals (22 groups) to the eastern slopes of Mount Duval on the Newholme property. Brian Glover was fasted around the easy course, with Torsten & Disa (and mother Karin) closely behind, slowed down by carrying flags and stands, thank you for collecting them! Fastest around the moderate course was Fiona, who was running very well and with further improved map skills will be a force to watch out for on the hard courses. Second place goes to steady but sure approach taken by Alex & Diana, our members who live in the other NT. Special mention goes to Zoe, who contested her first moderate course. Eric blitzed the short hard course with Maurice in second place. Due to a moderate map shortage, we had Andreas trying the hard course for the first time, which he mastered very well. Former Armidalian Ross Stewart (now ACT), visited us again to show us his good form, he was quickest around the long hard course. Don was almost 9 minutes behind him, closely followed by Alinta and Keith, who could not find the 3rd control, but ran a very good time. Split times are available on request. Judging by the smiling faces all around, everyone seemed to enjoy the beautiful spring like weather and Northern Tablelands slopes - thank you all for coming! The next event is our annual night event on Friday the 6th of September at the Pineforest. The big news from Banalasta was that Alinta & Felicity placed first and second on the Long Hard course. To my knowledge, this club has not previously had a female orienteer capable of beating the men on the long course (at least not in the 20 years that I have been a member), and now we have two! The weather tried to steal the limelight, but fortunately the forecast of a fine Sunday was accurate. However Saturday�s rain resulted in the last flags not being hung until Sunday morning, and a last minute change to the access track. The mud in the gateway at the yards looked bad, but amazingly no-one got stuck! Although numbers attending were not huge, it was good to meet Victoria and Libby from Tamworth, and we hope to see them at future events. It was also great to meet the students from Armidale � Tadeusz, Shani & Gwen. They win the �Perseverance Cup�, showing a dogged determination to finish whatever they started. It was obvious from results during the year that Felicity and Alinta were giving the men some serious competition, but this event saw a significant step up. As can be seen from the split times, their secret was consistency; the lead swapped between Felix, Peter & Eric in the early stages, but all the men fell away during the later stages to give Alinta & Felicity a very clear victory (10 minutes between 1st and 3rd). In fact the splits reveal some hilarious blunders � Alinta & Felicity both took less than 4 minutes on leg 9, while Don took 12 minutes and Peter 19 minutes!! The splits also show that Tadeusz, thrown in the deep end on some of the most complex terrain available to our club, was quite competitive over most of the course � his major time losses were concentrated into a few legs - so we hope he continues to come to club events, and build on the progress he has made. The sausages and soup seemed to go down well, only problem seemed to be that I didn�t cook enough sausages! Thanks to Eric Baker for bringing in 9 controls during his run� he says it cost him about a minute a control, but even if we took 9 minutes off his time, Alinta would clearly still have won. We will forgive Eric for failing to punch control 8 � his hands were full! Our thanks go to Grant Campbell, the manager of Birralee Station (which now owns all of the area covered by the �Banalasta� map), for permission to use the area. We should also thank the map maker, Eric Andrews from Stanthorpe. As I wandered among all the huge rocks either side of the main creek to the west, I kept thinking what a privilege it was to have access to such a spectacular area, and to have such a good map. 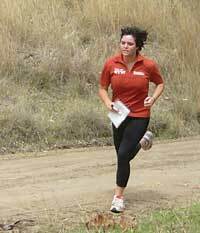 Judging by the number of entries for this week�s Twilight-O, Orienteering is alive and well in Armidale! Apologies for the shortage of maps and (to those who arrived on time) for my lateness � I had forgotten how slow my printer was! Anyway, it meant there was practically a mass start for the Moderate course, with an atmosphere like a Sprint-O event. Although the cunning old foxes Don and David were quickest on the Moderate course, some of the Juniors, such as Lindsay & James Symons, Torsten von Strokirch, Sam Watson and the Lesurf boys produced very impressive times (James was quickest on the Easy course). Just as impressive were some of the scratches from the blackberries! Only 3 people took on the �Wiggly Line�, with Eric�s experience easily meeting the challenge, but Garry commented that it was a good exercise, and made him concentrate much harder on his navigation than he usually does! Thanks to Eric & Garry for assistance with collecting controls � everything was tidied up before sunset.